We pack a lot in to our Wednesdays, and an all important stop is one of our local public libraries. 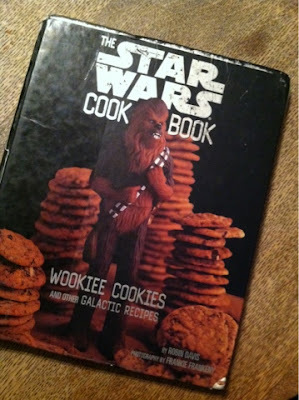 This week's fabulous find was made by Eli, The Star Wars Cookbook: Wookiee Cookies and Other Galactic Recipes, by Robin Davis. We'll be trying out all sorts of Jedi nourishment in the days to come, but for starters, we'll be enjoying some "Hoth Chocolate" with breakfast tomorrow! Anyone still out there? Did you miss me? I figure I'll just pick right up and keep going and pretend that empty interval of blogging slackness that occured from Jan 1, 2011 to Dec 31, 2012 never happened, OK? With the major exception of the addition of another baby human to our family, the basics of my life are still the same: living in the mountains of Virginia, homeschooling and gardening, and trying to take photos of it all! No photo for December 27. You'll just have to conjure up your own images of our 12-hour drive. Living in the mountains of Virginia, resurrecting the old family farm, homeschooling three children (and have another on the way! ), gardening, cooking and taking photos of it all.